A teaching assistant who was having an ‘in-depth’ conversation with a friend on a hands free phone when she killed a motorcyclist was today (Wednesday) jailed for three years. Here is the report from in the court. Samantha Ayres, 34, had been talking for more than 25 minutes on a hands-free phone and was completely on the wrong side of the road when she smashed in to devoted dad David Kirk, 26. Ayres, from Horncastle, Lincs, was last week convicted of causing Mr Kirk’s death by dangerous driving. Phone records showed Ayres had made four ‘hands free’ voice calls during her journey and was still mid-conversation just moments before killing Mr Kirk. Judge John Pini QC had adjourned sentence after finding the jury had considered the use of ‘hands free’ in these circumstances as dangerous. The judge today (Wed) jailed Ayres for three years after saying she was most probably distracted by her long phone call. Passing sentence at Lincoln Crown Court, Judge Pini told Ayres: “You had left work at Boston and at 5.34pm you were making the fourth of a series of hands free telephone calls. This final one lasted 27 minutes and you were still making it at the time of the fatal crash. “You collided head on with David Kirk and you were completely on the wrong side of the road. 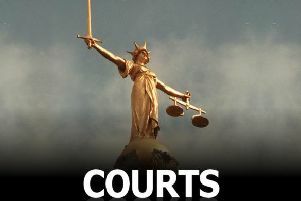 “You pleaded guilty to causing death by careless driving. The basis of your plea was that your rear nearside tyre contacted the verge which set in train a series of events causing you to lose control of your car. “The jury rejected your account and accepted that you were distracted by using your hands free phone. In my judgement your account of how this happened was dishonest. You were simply on the wrong side of the road. “The fact is you were so distracted , most probably by the long phone call, that you were not paying attention properly to the road and to other road users. “The evidence from Mrs Kirk as to the effect this tragedy has had on her and her young child was utterly heart-breaking. Ayres was also banned from driving for four and half years and must take an extended retest. The judge added “This is not a landmark case. The evidence is that you were on the wrong side of the road and to drive in such a way is dangerous in the absence of good reason. It is not currently against the law to use hands free kits unless you are touching a mobile but both the Highway Code and Royal Society for the Prevention of Accidents advise it could be a distraction. Mr Kirk’s widow, Katie, 26, was in court with other members of his family to watch Ayres sentenced. The father-of-one, from Lincoln, had worked at a motorcycle dealers in the city since the age of 14 and left a two-year-old daughter, Alyssa. Afterwards Mrs Kirk said: “David was killed in the collision with Mrs Ayres, it wasn’t an accident as the evidence has shown it could have been avoided by simply driving with proper care and attention. “As a result of the driving of Mrs Ayres our family now has to live with this tremendous loss. Alyssa had just turned one when her daddy was killed, she has her whole life to live without her daddy. Mrs Kirk added: “This case has had a lot of interest in the press due to the devastating impact it had on the friends and family of David, and the way the collision occurred. Ayres, who had been driving for just five years, claimed she lost control of her Ford Fiesta after a rear tyre went on to the verge. But police experts found no evidence on the road for her explanation. Collision investigator PC Godfrey Barlow concluded Ayres’ driving had caused the crash and said he could not discount the possibility that the lawful use of a hands free phone for such a period had led to a distraction. “The research shows less time is spent looking at the road,” PC Barlow explained. Ayres made four calls using the hands free system after leaving work in Boston, Lincs, at around 5.20pm on 7 November, last year. The first two calls recorded at 5.21pm and 5.24pm lasted one minute 29 seconds and one minute 19 seconds. At 5.27pm Ayres made a call of four minutes and 14 seconds to her mother in which she asked to borrow £40. Ayres then rang friend Marc Lunn at 5.34pm and was still connected to him in the moments before she collided with Mr Kirk on a rural road in Horsington, Lincs. Mr Lunn remained on the line for a short period after hearing Ayres swear. The length of the call between them was recorded at 27 minutes and 31 seconds. In a statement read to the jury Mr Lunn, who works for a VW dealership in Derby, said “I was sat in my VW when at 17.34 my mobile phone rang. “It was Sam. I could tell she was in a car. “The conversation was a catch-up about our lives and our families but also about the potential purchase of a VW van. “All of a sudden, there was no run-up or warning, there was an outburst from Sam of expletives, and the sound of the car going off the road then silence. Ayres admitted to police that she had been using a hands free phone and during her evidence said she used her car stereo to make the calls. She claimed to make the first of the four calls while stationary after finishing work and said some of the others were made while in traffic. Ayres told the jury she had known Mr Lunn, who was a car dealer, for ‘four or five years’, and she called him while sat at traffic lights because her partner wanted a VW camper van. “With Mark being in the business I wanted specifications, what was the best to buy,” Aryes said. Under cross-examination from prosecution barrister, Greg Purcell, Ayres admitted that it was an ‘in-depth’ conversation with Mr Lunn that covered several topics. Giving evidence Ayres claimed she was still speaking to Mr Lunn when she felt her rear passenger tyre go on to the verge. Michelle Stuart-Lofthouse, mitigating, said Ayres was genuinely remorseful and had suffered with depression, self loathing and suicidal tendencies since the crash. The jury were not told that just eight months before the crash Ayres was caught doing 58mph in a 30mph village limit in the same area where Mr Kirk died. Ayres signed the speeding declaration after being caught on 16 March 2016 but was not prosecuted because of a computer malfunction in issuing the ticket. The incident was not revealed to the jury as Judge Pini ruled speed was not a factor in Mr Kirk’s death.